Eye Exam The All-Too-Long History of "Contemporary Art from the Middle East"
“We were never more free than under the German Occupation,” writes Sartre at the start of “The Republic of Silence.” This paradoxical sentiment aptly describes the state-imposed conditions under which freedom and access to understanding images has been ironically more available within Iran in the years after the 1979 revolution and the establishment of the Islamic Republic. Of course, the state has understood the power of images and has long been an image machine, but what is less obvious is that the state’s image machine not only operates within itself but also influences conditions of visuality, image production and circulation outside its realm of control, access and power. Ironically, the current exhibitions on view at the Museum of Contemporary Photography, “Burnt Generation: Contemporary Iranian Photography” and “Midwest Photographers Project: Hossein Fatemi,” prove the persistence of this state image machine. The photographs in these exhibitions hope to contradict those of the state and offer a truthful account of social events within Iran. And yet, the exhibition entirely prevents the viewer from accessing any of the historical processes behind these photographs and merely introduces them as a collection of artists documenting social contradictions and complexes to be interpreted with the help of the many wall labels that forcibly narrate their contents and attempt to equip the viewer with proper cultural and social cues. This type of curation has created an understanding of what Iranian photography should look like and what should be the core concerns and occupation of Iranian artists, prescribing them to work with identity, socio-political issues and war trauma. The interest and ease in curating these regional and national exhibitions is grounded in a desire for promoting diversity, tolerance and accessibility from a Western curatorial perspective by showcasing artists of the Global South. “Burnt Generation,” curated by Fariba Farshad, director and co-founder of Candlestar, a private company based in London, is on a global tour which, according to the company’s website, “showcase[s] life in Iran through the lens of eight major photographers.” Exhibiting a stable collection of artists that function as the traveling national figures of Iranian contemporary photography—a syndrome I call the “roaming collection of artists”—this show includes pretty much the same exhibition narrative, more or less the same artists and a similar effect as many other shows on this subject. 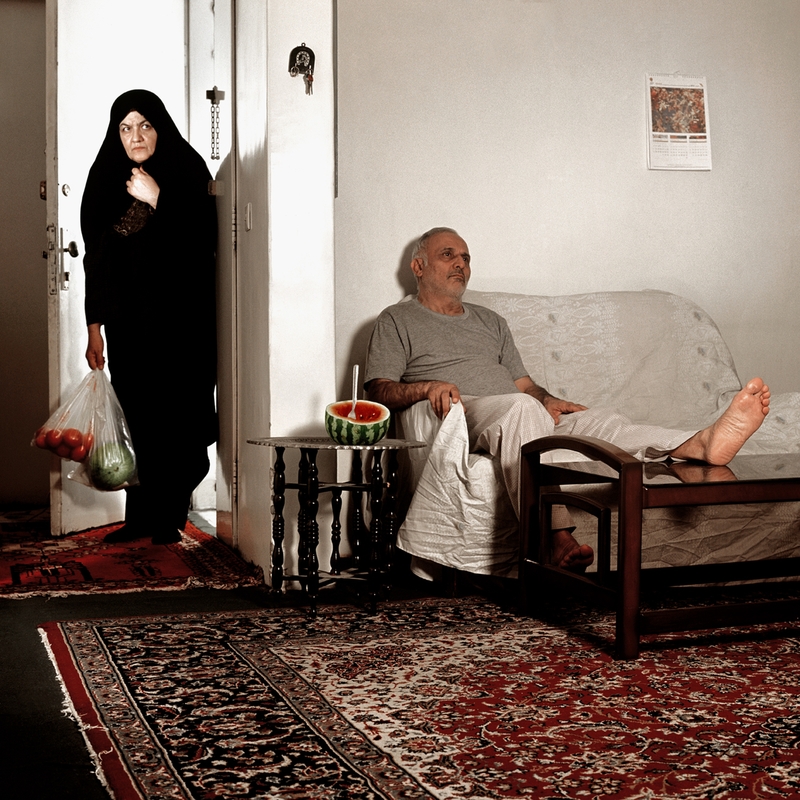 An example is the recent exhibition at the Museum of Fine Arts, Boston, “She Who Tells A Story: Women Photographers from Iran and the Arab World” in which Shadi Ghadirian, Gohar Dashti and Newsha Tavakolian showed pretty much the same body of work shown here at the MoCP. Among the other participants were star figures such as Shirin Neshat and Lalla Essaydi, whom are also most often exhibited together in national and regional exhibitions of photography from the Middle East. Similarly, Los Angeles’ LACMA exhibit “Islamic Art Now: Contemporary Art of the Middle East” starred Shirin Neshat, Shadi Ghadirian and Sadegh Tirafkan, among others. The wall labels in the primary exhibition, and more so in Fatemi’s Midwest Photography Project, catalog and concretize whatever possibilities the viewer could see in these images. The captions become the end point in which the meaning and the image have become all too exhausted, all too delineated by the accompanied text to generate any other dialogue other than the one already assigned to them. Seemingly innocuous and instructive wall labels dictate the viewing experience. 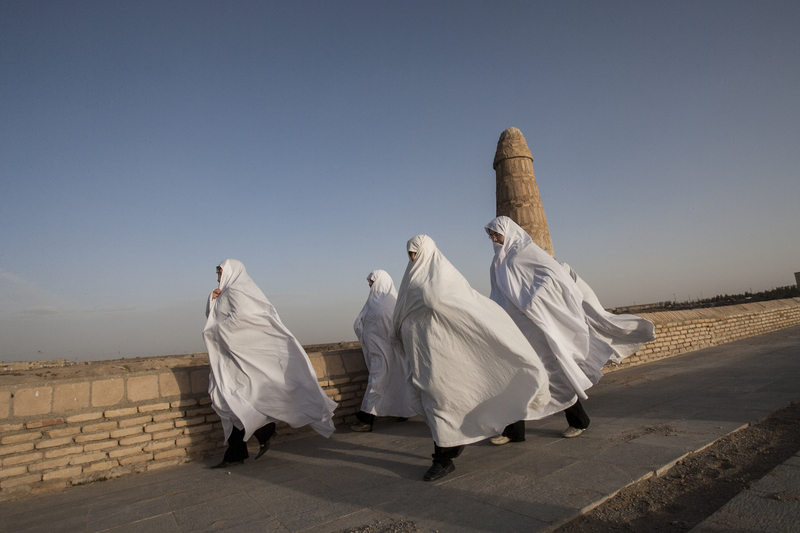 “A group of women dressed in white chadors, crossing the Varzaneh bridge. White is traditionally worn to ward off the evil in the region.” reads a wall label next to Hossein Fatemi’s photograph. Another label reads “After enjoying a drink at a party two young women dance. Unrelated men and women are forbidden to socialize together […].” This prescriptive labeling turns these photographs into windows of access in a failed attempt to make sure that we see and to make sure what we see. This paradigm fits well with neo-colonialist narratives of the democratization of “burnt” societies, which always occurs within the discourse of education and enlightenment for the Western audience—in this case, the lesson is what it means to be living in “a paradoxical society.” This neo-colonial rhetoric always closes the dialogue instead of opening up, dictates instead of democratizes and exhausts the image rather than allowing it to simply exist. One should reconsider and be critical of the fixations and representational expectations these exhibitions generate with their curatorial narratives promising the all new, against-the-cliché approach to these contexts, societies and their people at large. If this approach to countering saturated media imagery and preconceived cultural stereotypes is the main curatorial statement behind these exhibitions, it will not succeed and will only make for another platitude of socio-political assumptions.